Embark on a rescue mission! Collect powerful gems to restore harmony to nature! 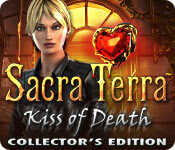 Sacra Terra: Kiss of Death Collector's Edition is available for free download. You can play the downloadable version for free for 60 minutes. After that time if you liked the game, you can buy it online. Downloading Sacra Terra: Kiss of Death Collector's Edition is 100% safe. The game size is 703 MB.